In 2019, international expert outlooks for the year ahead have summarised the theme for the year as people seeking equilibrium with a desire to address reality as opposed to escaping it. “Homes are no longer about being ordinary but in chaotic times, humanity will look for peace within their inner circles and create extraordinary spaces in their homes,” says international trend caster, Li Edelkoort. There is no better example of this than taking natural environment design inspirations to create beautiful accessories for the home like LIQUIDRed’s gorgeous bathroom accessory and tapware ranges. The VALOUR tapware range’s contemporary design boasts bold lines whose design is encouraged by urban living. Geometric lines, solid buildings and sky-scrapers drive the design inspiration behind this range, drawing the dynamic energy of the city into the bathroom. From the makers of Bathroom Butler comes LIQUIDRed. 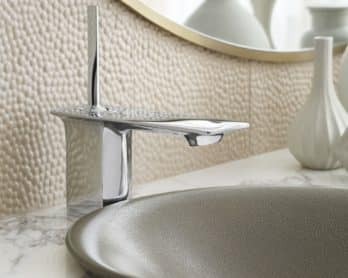 Like the whole LIQUIDRed bathroom accessories range, LIQUIDRed taps bring any bathroom instantly into the 21st Century. Engineered and designed to the highest, up-to-date standards, our taps pour cold water over the theory that you can’t have a great looking bathroom without spending a fortune.